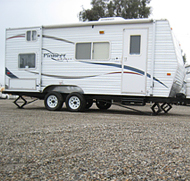 Performance - This RV Trailer Stabilizer will significantly reduce the rocking, wiggle, and shaking movement of your camper trailer, 5th wheel, or Tiny home. Although, every trailer is different, we receive many comments that it removes 95 to 98 percent of the movement. It is the only system that the bars literally anchor your trailer frame to the ground (it stabilizes the frame not the leg or jack). The rigid braces and brackets both push and pull on the frame eliminating movement in both directions. No other trailer stabilizer does this. So innovative that 3 patents were Issued. Quality - Every part of the system is designed to provide a specific function and be durable for many years. It is designed by a Mechanical Engineer (RVer) and is Heavy Duty. All parts except fasteners are Made in the USA and are powder coated and/or zinc plated. Fasteners and castings are imported by our USA suppliers. We will replace any part that fails mechanically under normal use for at least 10 years. Ease of Use - Tightening 3 conveniently located handles is all that is required to engage the system. The system remains on the trailer and goes up and down with the trailer jacks when you set up. Other than good quality fifth wheel and travel trailer leveling jacks, no other equipment is required. No other system is this easy to use. Works much better and much easier to use than 5th wheel King Pin Tripod. Please checkout the links below. 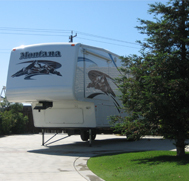 We believe our customers provide the most credible input for the Best RV, Fifth Wheel, Camper, or Trailer Stabilizer. 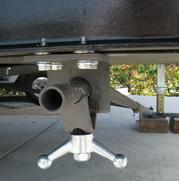 The Only Trailer Stabilizer System that ANCHORS Your Trailer Frame Directly to the Ground with Rigid No-Play Bracing. We don't stabilize the Jacks, we stabilize the frame! Wow, what can I say - excellent product! The craftsmanship is superb, the instructions thorough and easy to follow, and most rare, your personal cell phone number for help in the first steps of the instructions! I've spent my entire career in customer service - you sir set the benchmark. The best news is it works as advertised - totally delighted and will recommend to my friends and fellow campers. I'm impressed once again. The system is very effective, and an excellent value overall. Packaging, quality, instruction all first rate. Thank you sir....for a great and effective value. We are confident you will love our product based on the excellent feedback we continue to receive from our customers. If you are not completely satisfied with our system or for some reason it cannot be installed on your camper trailer, you may return it for a complete refund including shipping (shipping US customers only).